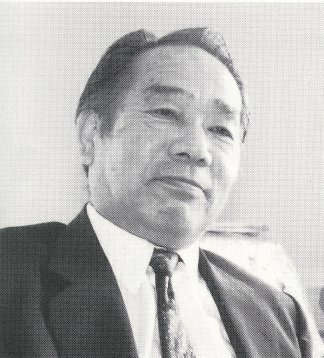 Tsuneo Ando (安藤毎夫) spent 14 years as uchi deshi to Gozo Shioda, the founder of Yoshinkan Aikido, and is said to closely resemble him in terms of size, speed and style. Born in 1956 in Nihama City, in Ehime Prefecture on the island of Shikoku, he first encountered Aikido after joining the Tokushima University Aikido Club. After graduation from the university he came to the realization that the life of a Japanese salary-man was not for him, and decided to enter the Yoshinkan as an uchi-deshi. 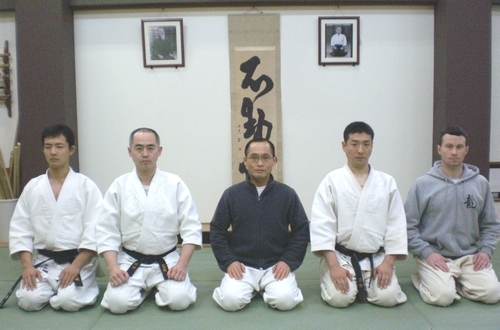 He now heads Yoshinkan Aikido Ryu, founded in October 1996 and centered in Urayasu City in Chiba Prefecture, Japan. This is the first part of the English translation of a two part interview with Tsuneo Ando conducted in 2010 that appeared in the Japan Internet Newspaper JanJan. 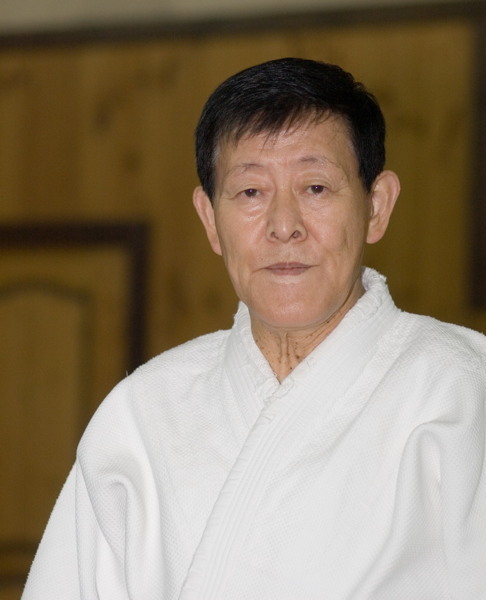 Tsuneo Ando, who slept and ate with that Mr. Shioda as an uchi-deshi, now presides over “Yoshinkan Aikido Ryu” (養神館合気道龍), and works for the growth and education of Aikido. Q: In addition to yourself, there are also people such as former Yoshinkan Kancho Kyoichi Inoue (井上強一), Takefumi Takeno (竹野高文), Tsutomu Chida (千田務) and Shioda’s son Yasuhisa (塩田泰久), but I often see you appear when watching films of Shioda Sensei. How did your original encounter with Aikido occur? 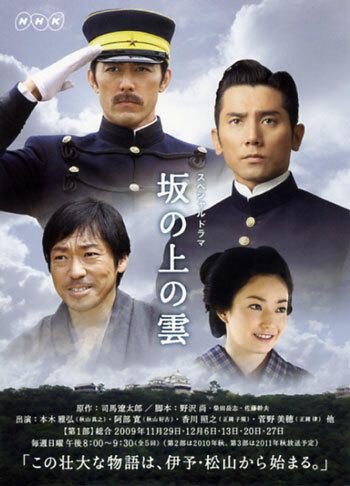 A: My home-town is in Eihime Prefecture, which was recently featured in the NHK television drama “Clouds Over the Hill” (“Saka no Ue no Kumo” / 坂の上の雲). I went to school at Tokushima University, and that’s why I enrolled in Aikido. Until that time I had never been good at sports, but I enrolled in Aikido without knowing what it was at the suggestion of a Sempai from my home-town. 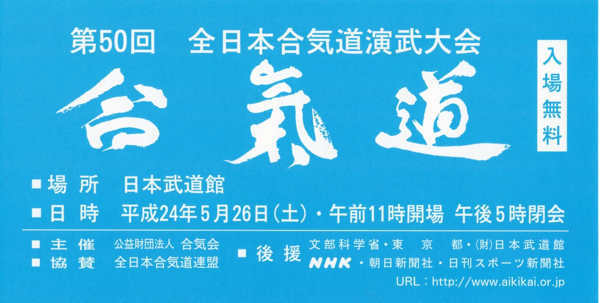 I learned from the head of the Aikikai’s Tokushima Prefecture branch, Taisuke Kudo Sensei (工藤泰助). But my first impression of Aikido was something like “I don’t understand what this is”—“What’s Aikido, anyway?”. Q: Then, during your time as a student you once went up to Tokyo for a Gasshuku at the Yoshinkan? A: When I was a Junior in college I had to repeat a course. I had some time then, so I thought “Hey – I’ll go do a Gasshuku at the Yoshinkan!”. Chida-san (former Yoshinkan Hombu Dojo Head), who was my Sempai at the university at the time, was at the Yoshinkan as an uchi-deshi. Earlier, when Chida-san was enrolled at Tokushima University, we had trained together in the Tokushima University Aikido Club. After that Chida-san returned to the Yoshinkan as an uchi-deshi. I had heard “the Yoshinkan is incredible!”, and from looking at the books it seemed as if they had completed a system for technical development. This was in the spring of Showa year 53 (1978). Q: At the time Shioda Sensei was in his early sixties, and he was still quite active – what was training at the Yoshinkan like? A: It was exhausting. (laughing) As to what was exhausting…of course it was physically exhausting, but in the end is was mostly mental exhaustion. There was a lecture, “Zagaku” (座学), every Thursday afternoon, once a week. That is, the uchi-deshi would gather in Seiza and have an evaluation meeting. 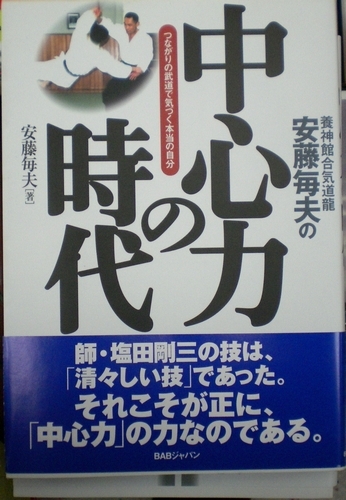 The person called on by Shioda Sensei would speak about their “Daily Reflections and Habits”. For example, “Yesterday, I had a cold and was a burden on others” (reflections), or “if there’s some trash I throw it away” (habits). The senior students would then comment. “That’s a good attitude…” and so forth. At times Shioda Sensei would further comment on those comments. That would continue for about an hour, and we were told “absolutely no movement from Seiza!”. Seiza was so painful that I couldn’t even hear what was being said. Greasy sweat would dribble off me, my head would spin, I just waited while praying to heaven for it to end. Then, in training, they said “Suwari-waza” and we would practice basic techniques on our knees. We did that kind of training constantly, so by the second day of the Gasshuku my skin was raw and bleeding. The knees of my white Keiko-gi were dyed bright red with blood. 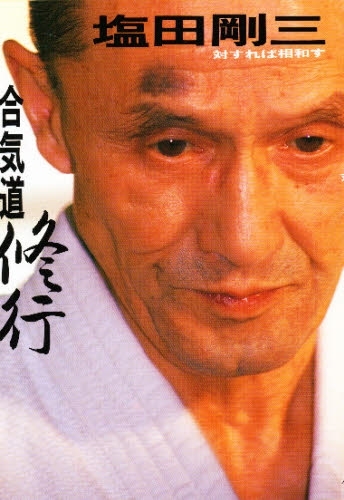 Even when he saw those bright red Keiko-gi Shioda Sensei said “do Suwari-waza!”. I thought “this person is an ogre”. In the end, the wounds on my knees didn’t heal until after the completion of the one month Gasshuku. Q: The red knees against the white background of the Keiko-gi, that’s just like the Hinomaru (Note: the flag of Japan), isn’t it? A: Yes, that’s right. From the beginning I thought that it would be strict, but I was really overwhelmed psychologically by the Gasshuku. More than the physical limits, it was the demands to endure through injury and the severity of Seiza that were overwhelming. “Aikido is impossible for me, I’m going to quit…”, I thought. Q: Did you quit Aikido after that? With all that free time pushing me, I gradually started feeling like I wanted to do Aikido. 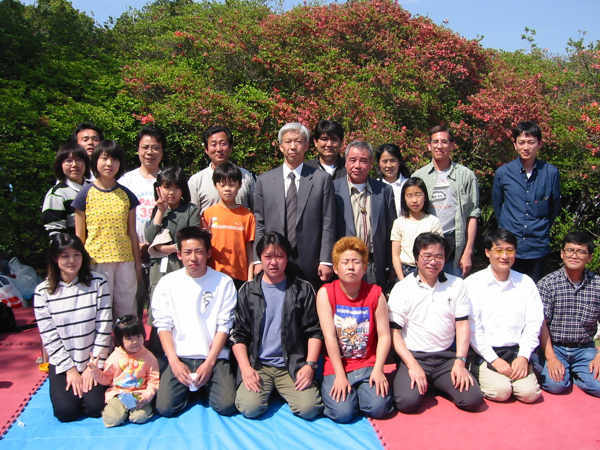 There was a person named Sadao Takaoka Sensei (高岡貞雄) in Wakayama. That person had learned from the Founder Morihei Ueshiba in the last years of his life for just two weeks and then continued with Aikido for some thirty years after that. In a way, he was someone who had come to investigate that path through self study. That Sensei taught me the results of his research without reservation. As that happened I began to catch fire, and I thought “I knew it! It’s Aikido! Aikido is fascinating! For me there’s nothing besides Aikido..”. Q: With Takaoka Sensei giving you hands-on teaching in the Hiden (“secrets” / 秘伝) there’s no way that it wouldn’t be fascinating… However, you needed a job in order to make a living. A: Actually, around that time I made a terrible mistake at work. At the time we were bidding on a contract in one of the cities, and I was sent as the person responsible for putting in the bid. I wrote the amount that had been decided by the company, and we should have lost the bid, but I made a mistake when I wrote one of the digits… (laughing) That threw the bidding into total chaos. It was really a mess. Also, the food at that time wasn’t very good. I never really felt hungry. Even though I wasn’t really hungry I would eat when it was time to eat. But after Aikido practice the food was always delicious. (laughing) “Am I going to put up with food like this for the rest of my life? Where’s the pleasure in life? I don’t need money or guarantees for the future. Just eating delicious food and enjoying each day is the most important” – so I decided “I’ll do Aikido!”. So I decided to quit, and I thought “I’ll become an uchi-deshi to Takaoka Sensei”, but Takaoka Sensei didn’t have very many students and it didn’t seem as if I would be able to make a living doing that. That’s when I called Chida Sempai at the Yoshinkan. When I asked him if the Yoshinkan would be able to pick me up he said “I’ll ask Shioda Sensei and call you back tomorrow”. When he called back he said “Shioda Sensei said ‘Come! '”, so I entered the Yoshinkan. Q: You graduated from the university and found work, I heard that you were around 24 years old. Was there anybody around you who was against this? When I think about it now, my answer was really cocky. Still, what I said back then was the foundation for my life now. When one starts to do what they want to do then next perhaps they will discover what they must do. I believe that all humans beings have a mission to fully cultivate the gifts that they have received from the gods (heaven), and it is my experience that the mission that has been given to us from heaven is to “pursue the things that you love to the end”. In modern Japan, since lifetime employment and promotion by seniority are already things of the past, this type of lifestyle has become easier. In that sense, one could say that this is a good era in which to be alive. Q: What was the so called “life of an uchi-deshi” like? A: I became an uchi-deshi on May 21st of Showa year 56 (1981). At the time they gave me 60,000 yen and a place to stay but you had to provide for yourself out of that. 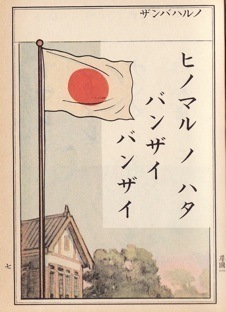 Uchi-deshi at the time were given a large variety of tasks. In addition to cleaning the Dojo, there was caring for the instructors – for example, preparing tea, meals, changes of clothing, driving cars, preparing the bath and washing their backs…In any event, the uchi-deshi did whatever was needed. Just like the phrase “Aiki is Life” (合気即生活), everything in life was Aikido. However, our living expenses were provided for, so that is all that we wished or hoped for. First of all, being able to do Aikido all day the food always tasted delicious. Then, we could be near the master Gozo Shioda, and even receive money on top of that. We thought “could there be any place better than this?”. 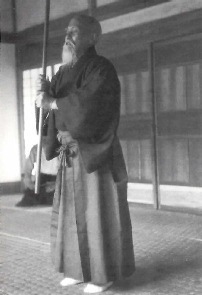 The Yoshinkan uchi-deshi system was a modern arrangement based upon the service provided to the Founder Morihei Ueshiba by Shioda Sensei before the war at Ueshiba Dojo. For example, the telephone. Picking up the phone when it rings is too late – we were told “Pick it up before it rings!”. I thought “that’s crazy!” but I found out that this was training in sensing the atmosphere of the phone as it is about to ring and threw myself into it. When I did that there was never a time when I was unable to pick up the phone before it rang. (laughing) Actually, just before the phone rang the receiver would click, and we would pick it up at that moment. There were times when we could successfully pick it up before it rang. At those times the person on the other end would turn out to be quite surprised. So we were always running around on pins and needles when we were in the office. At that time the Yoshinkan Hombu was in Koganei-shi in Tokyo, a two story dojo with 185 tatami mats. On the first floor were the living quarters, Kancho’s office, the dojo office and the dining hall. It was wide open and spacious. For example, the doorknob to Kancho’s office would click, and in an flash we’d leap out ahead of Shioda Kancho and open the door to the toilet. Eventually Shioda Kancho would enter there. Due to the structure of the building, the office where we uchi-deshi waited was further from the toilet then Kancho’s office, and even a slight delay would result in Kancho opening the door to the toilet himself. For that reason, our bodies had to be ready to respond in an instant. It was as if it were the start of the 100 meter dash and the office was always under the tension of the starting gun. It had a thrill that made us think that this was real ascetic training. In the morning and the afternoon we would train with the riot police, and then in the evenings would be training with the general public. Six hours a day… I had quit my job and come to the city from the country, here was my “last stand” (背水の陣). Just as rumored, the life of an uchi-deshi was severe, everyday I felt “today I’ll fight hard for one day” “anyway, just fight hard for one day” – without a thought for the future, I desperately got through it somehow. I came to appreciate the setbacks that I had experienced during the Gasshuku of my student days. While that was happening, some time in October, I injured my neck during training and the office manager said “go to the doctor!”. I answered “I’m fine, I can’t go because I don’t have insurance”. Then the office manager intervened with Shioda Sensei for me “Ando-kun has a severe neck injury. Let’s make him part of the staff so that he’ll be covered by our insurance”. Thankfully, Shioda Sensei said “do it!” and I was able to become a member of the staff. It was really a “lucky accident” (けがの功名), wasn’t it? It’s odd, but until now I have only been injured that one time. Q: From entrance, right to staff…that’s a rapid career advancement (laughing), did you receive direct instruction from Shioda Sensei from that time? A: No, at first I was taught by the senior students. I wasn’t taught by Shioda Sensei until four or five years after I started there. What was frightening were the local demonstrations. One never knew where Shioda Sensei’s technique would emerge. I would attack and receive Shioda Sensei’s technique, so it’s decided from the beginning that I would be defeated. For that reason, when my name was called out to take Uke for a demonstration I would think “Ahh, I’ll be the next one to eat Shioda Sensei’s technique…”, and I’d fall into gloom from the night before. I felt as if I were a soldier planning for an assault. However, among the uchi-deshi, taking Uke for Shioda Sensei held a certain amount of status. Being able to take Uke for Shioda Sensei was proof of coming of age, but I didn’t want to remain satisfied with just that. Taking Uke for Shioda Sensei was important to me, but I thought that it was even more important to really accomplish the skills that Shioda Sensei had achieved. Q: Were there things that could only be learned through that precious experience as an uchi-deshi? A: In the end, being near the teacher, and being able to sense the vibrations of his thoughts directly was an important point. When one is always near it may be that their minds become synchronized in a way, or that distractions are eliminated, it is something of a heart-to-heart communication (以心伝心) . The other day at a meeting one of the instructors, who wasn’t an uchi-deshi, said, wondering, “I sometimes had a chance to drink tea alone with Shioda Sensei for an hour. In the training after that, the techniques would always become more fascinating”. When I went abroad with Shioda Sensei we would be together around the clock, it was truly a learning experience. 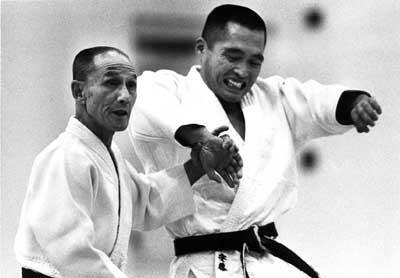 Shioda Sensei once said “I learned about Aikido thanks to my Father”. Shioda Sensei’s father was a physician, a wealthy person. When Ueshiba Sensei traveled to far away places he made it a point to take Shioda Sensei with him – Shioda Sensei’s father would speak to Ueshiba Sensei’s attendant and slip him an envelope full of money. Ueshiba Sensei would anticipate that and designate Shioda Sensei to accompany him… (laughing) As a result, he really “learned about Aikido thanks to his Father”. In the end, staying with your teacher twenty-four hours a day…I think that it is important to experience that time. Q: After that you resigned from the staff of Yoshinkan Hombu and opened a Yoshinkan branch dojo on your own. A: Shioda Sensei passed away in Heisei year 6 (1994) at the age of seventy-eight. I resigned from Yoshinkan Hombu on September 30th of Heisei year 7 (1995), at the age of 39, thinking to become independent. I thought “Now I will go out into society, and test my strength against society as a teacher”. Q: Once you separated from Hombu you must have understood how difficult it is to independent. A: First of all, I didn’t have any knowledge of how to run a dojo. When the Yoshinkan was established everybody came to help because of Shioda Sensei’s technical skill and character. But it wasn’t the same when it came to me. How to pull things together and establish something from nothing…I got here groping and bumping my way along. However, all that aside, what was really difficult was when my wife became ill. The condition of her breast cancer gradually worsened, and on January 29th of Heisei year 9 (1997) she passed away. I was forty years old, and my wife was thirty-six. At the time I still had young children, one in third grade and one in first grade. I thought “maybe I should go back to my hometown in Shikoku”. My parents said “come home”. But my heart sank when I thought about going home. The reason for that is that a short time before my wife passed away I had somehow begun to understand what could be called the essential point of Aikido, “Center Power” (“Chushin-ryoku” / 中心力). This was the time when I began to think “Don’t I have a mission to transmit this essence of Aikido to future generations?”, so I was torn between returning to Shikoku and getting a normal job and raising my children while continuing my research into Aikido. When my wife was ill I moved from Urayasu to a relative’s rented house in nearby Ichikawa City of Chiba Prefecture. By and by my wife passed away and I had to leave that house. For a month I worried constantly about where to go, but the day after I got the news “you have to move” I found a place in Urayasu. We started over again in Urayasu, where we had lived before. I was advised to make this fresh start based on the “prediction” from a fortune-teller that my Aunt consulted, but my actual daily life was hard. Going shopping at the supermarket, making the children’s Bento, laundry and parent’s days at school…I had to do all of the things that my wife had done up until that time. Q: Up until that time you had never experienced cooking, cleaning or other household chores? A: At least I did them during my time as an uchi-deshi, but when it comes to raising children the level is completely different. There were many trying times during that period in Heisei year 9 (1997). However, I think that I was able to galvanize myself through my wife’s passing. I thought, “Even while raising children, I need the training and growth of Aikido”; “I endured many trials, but it was thanks to them that I was able to push myself and became able to change myself”. Q: You have built a website for Yoshinkan Ryu and keep a blog. Isn’t it unusual to see an Aikido-ka who’s so knowledgeable about IT? A: I started around the time that “Center Power” (“Chushin-ryoku” / 中心力) became a focus in the media, around Heisei year 8 or 9 (1996-1997). It was around Heisei year 7 (1995) when my late wife said “from here on out will be the age of the internet”, so I purchased a computer. After my wife passed away that computer, which was around 300,00 yen at the time, was left behind, so I thought “I have to use this somehow…”. So I built a website. At the time, I made it with the Windows 95 Notepad. Now when I go to the electronics stores and tell the people there “I built a website with the Windows 95 Notepad” they don’t believe me. Anyway, somehow I was able to build a website. It was the first try in the Yoshinkan, in Heisei year 9 (1997). In Heisei year 10 (1998) a young person came hoping to become an uchi-deshi. When they asked “where is the dojo?” I replied “there isn’t one”. At the time I was still teaching at public gymnasiums and Budokans. But I re-considered, thinking “without a dojo I cannot raise uchi-deshi”, and made up my mind to establish a dojo. Q: I had heard that you had your eyes opened to the techniques of Aikido through being sent to instruct at a Kindergarten? 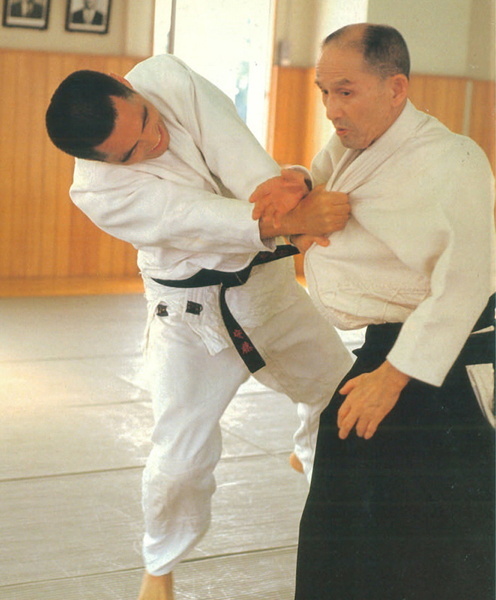 A: No, it’s not that I had a Kindergarten child as a training partner and understood the techniques…however, within my Aikido being dispatched to instruct at a Kindergarten is something that I cannot forget. About one year had passed since I had started as an uchi-deshi, it was just the time when I thought that I was beginning to get used to life as an uchi-deshi. I was ordered by one of the Shihan who was my supervisor to “go teach at the Kindergarten”. It was “Himawari Yochien” (ひまわり幼稚園) in Kawagoe City in Saitama Prefecture. This Himawari Yochien wanted to start programs in Aikido and soccer. This was some twenty-seven or twenty-eight years ago, so it was a very progressive school. They were the first Kindergarten in Japan to have a bus service for the children. I would teach there twice a week from the morning to the evening. 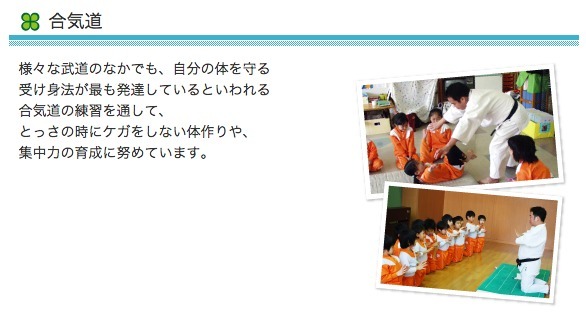 After that I would teach elementary school students who had graduated from the Kindergarten. My predecessor had not been able to deal with the stress of having only Kindergarteners and elementary school students as partners, and I was the replacement. Other uchi-deshi were teaching and practicing together with police officers or the general public at Hombu Dojo, anyway, they were full of energy. At the time the Hombu Dojo was in Koganei-shi, and Kawagoe-shi was quite far, and with only Kindergarteners and elementary school students as partners it felt as if I were being banished to the outer islands. I thought that if things continued this way that I would be forced to resign as an uchi-deshi. Actually, my predecessor had done just that. The people around me were also thinking “if that were me I would have to resign…”. Interesting story. 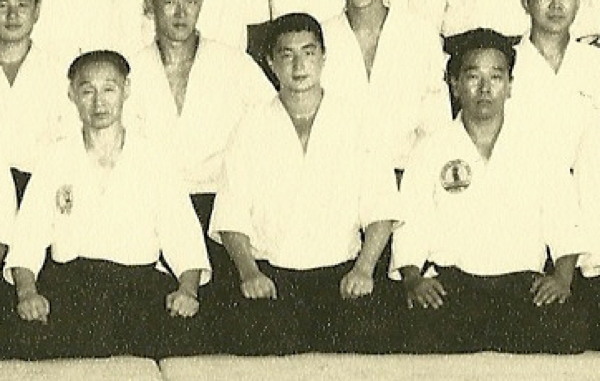 I think I was Ando Sensei’s first foreign student at his first dojo in Urayasu-shi in 1989-90. It is great to see how successful he has become. I checked out more than a few places before finding him. Although only a year, it was a great experience. We crossed paths – I was living in Tokyo during that time!